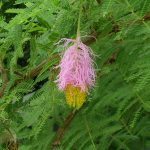 Chinese Lantern Tree Can Brighten Your Landscape - Richard Lyons Nursery, Inc.
Dichrostachys cinerea is a long-lived, spiny, moderate-sized Old World legume that may be just the thing to add something unusual to your yard. In the wild it ranges from 5-23 ft. in height, and it bears a resemblance to an Acacia. Its thin trunk produces a rough and often fissured bark. Young twigs are slightly hairy. The scientific name Dichrostachys translates to “two-colored spike,” and therein is the basis for the plant’s common appellation. 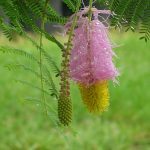 The inflorescence is a pendant, fragrant cylindrical spike featuring pale purple or lilac flowers at one end and yellow at the other. The appearance of the flower spike is considered by many to be reminiscent of a Chinese lantern. D. cinerea has become widely distributed worldwide over the centuries, and accordingly has picked up several other common names. Among the more unusual ones are Acacia Saint Domingue and Kalahari-Weihnachtsbaum, attributable to the influence of European colonialism here and there. Another name, Sickle Bush, refers to the shape of young seed pods. The Chinese Lantern Tree is considered medicinally valuable in Africa and India. Various parts of the plant are said to be beneficial in the treatment of coughs, epilepsy, toothaches, leprosy, headaches and — ahem — social diseases. D. cinerea not only has a lengthy flowering season, but it is not at particular about soil quality. As a bonus, it makes a very nice bonsai subject. It is available at Richard Lyons’ Nursery in 3gal. containers.